Dungse Garab Rinpoche is a main younger generation holder of the Dudjom Tersar lineage. 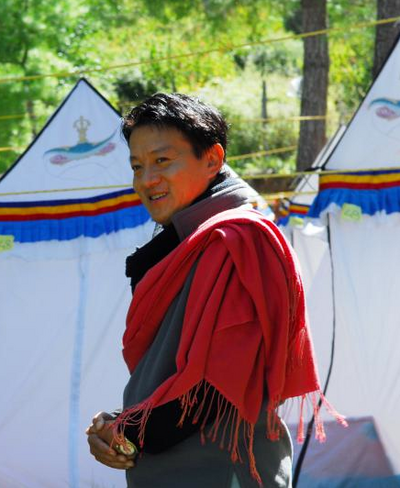 Based in Buthan, he is cherished by hundreds of thousands of dharma practitioners, and have made the Chö practice of Tröma Nakmo at the heart of their practise. Dungse Garab Rinpoche was born in Brekha, eastern Bhutan, from a family deeply blessed by the Dharma. Dungse Garab Rinpoche is one of the sons of Thinley Norbu Rinpoche, hence younger brother of Dzongsar Khyentse Rinpoche, and grandson of Dudjom Rinpoche. His maternal grandfather is the great Drukpa Kagyu master Lama Sönam Zangpo, one of the main disciples of Tokden Shakya Shri. Dungse Garab Rinpoche’s responsibilities are very vast and includes taking care of Rangjung monastery, yogis’ temples, shedras, retreat centers, monks and nuns, young lamas and anis. He yearly conducts major drupchen of Vajrakilaya and Tröma Nakmo and a variety of empowerments. Dungse Garab Rinpoche Rinpoche has erected the victory banner of Dharma all over the land of Bhutan, and especially the Dudjom Tersar lineage, making it blossom in centers can be found in every county and city, no matter big or small, of the country. Since the passing of his father, Dungse Garab Rinpoche has also taken the responsibility of Thinley Norbu Rinpoche’s sanghas in the United States (Kunzang Gatshal), and leads there every year a closed and very strict Tröma Nakmo retreat. This page was last edited on 19 May 2014, at 13:03.